The moon is the result of a primordial collision between a Mars-sized planetary body and our planet, but little else beyond this is certain about the silvery world we can see whenever we look at the sky. Despite 61 space missions, six of which were landings, where astronauts collected moon rock samples, there are a whole host of questions. Particularly – exactly how much of the moon, a natural satellite is actually made up from Earth, and how much from this strange, lost world – and what was it like? Researchers working in France and Israel might have enough evidence to answer one of those questions, finding more about the smaller planetary body that hit us. Apparently, it’s not all that different from home – with a composition that was likely similar to Earth. The latest models proposed suggest that the moon’s current composition is explained best if whatever happened to strike the Earth also formed nearby, in the early days of our solar system – a time of extreme chaos. It is believed that Jupiter alone caused a number of violent collisions between the other worlds in our solar system, before being dragged to its current orbit by Saturn. Two subsequent studies have proposed that both of these worlds continued to accumulate new material as they were continually bombarded with smaller protoplanets. Unlike the moon, however, Earth managed to gather more of this cosmic dust. The most supported explanation is the “giant impact hypothesis,” which states that the moon first came into being about 4.5 billion years ago, the remains of an accident in which our planet was struck by an object approximately the size of a planet, roughly one tenth the mass of Earth. 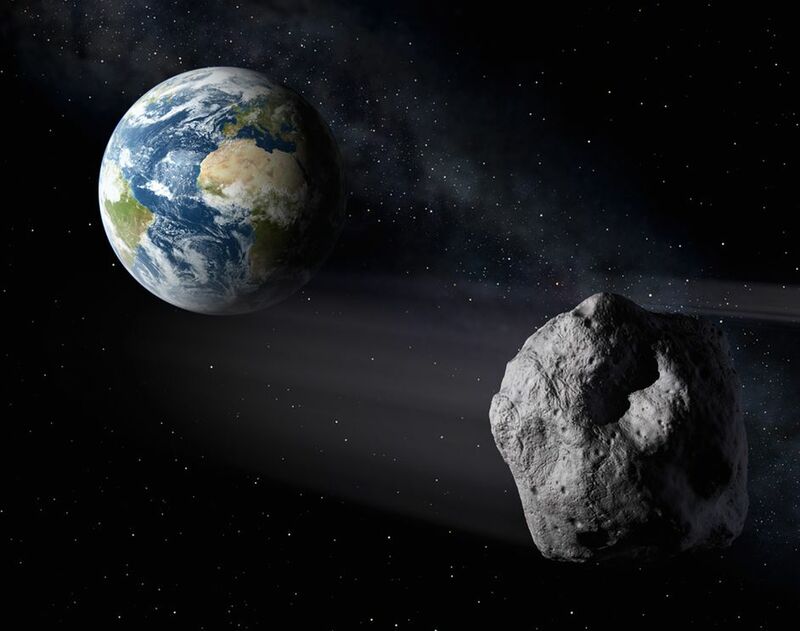 Attempted recreations of what happened and recent studies of the moon rock samples have suggested that our moon should consist primarily of remains from this mysterious impactor, which planetary scientists call Theia. If this is the case, it would explain why so many of the moon rocks resemble the minerals composing the Earth’s mantle. The main problem faced by the researchers is that so often, planets bear very distinct compositions from each other. Mars, Mercury and the big asteroids like Vesta, for all that they have in common, also have slightly differing ratios of their respective elements. If this world known as Theia first developed in a remote part of the solar system, then its makeup would be significantly different from that on Earth, and therefore the bulk of the moon should not be so similar to the Earth’s mantle. It had to have struck Earth with a glancing blow, anything stronger could have destroyed it well before the first life forms began appearing on its surface. In their effort to solve the problem, Alessandra Mastrobuono-Battisti and Hagai Perets at the Israel Institute of Technology both pored over data from a series of simulations – covering the scenarios of 40 different artificial solar systems. The effort applied more computer power than had been utilized by any previous study. The model simulated the growth of the planetary bodies we’re familiar with and then set them off in a game of cosmic billiards, consistently striking each other with their orbits. When they developed this new simulation, they considered that any planets found farther away from our sun typically contain a greater relative abundance of oxygen isotopes, consistent with chemical mixes observed within the Earth, as well as the moon and Mars. Therefore any such planetesimals that were to form near our planet would contain similar chemical traces. “If they are living in the same neighborhood, they will be made of roughly the same material,” said Perets. The team described their work in the journal Nature: the majority of these interplanetary collisions were about 20 to 40 percent—big, occurring among bodies that had formed from similar distances near the sun, which was responsible for their similarities in makeup. It’s far less likely that Theia would have sailed a long distance before impacting the planet, and the study lends credence to this idea. Not all is readily explained in their work. There’s still a wealth of the element tungsten, which needs to be explained. This element, categorized as a siderophile – iron-loving, is expected to sink towards planetary cores as time progresses, something that would affect its variability on planets throughout the solar system, even if they did in fact form at the same time, as Earth and Mars are believed to. Bodies develop their That’s because bodies of cores with different rates, based on a number of variables including size. 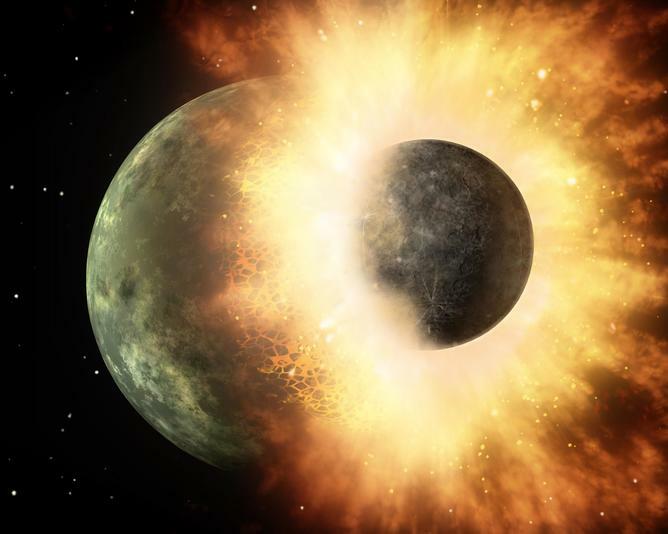 Although a little mixing as a result of the impact is inevitable, much of Theia’s tungsten-rich mantle material would be flung into orbit from the explosion and eventually incorporated into the moon, making the amounts of tungsten on Earth and the moon considerably different. In the two independent studies which appeared separately in the journal Nature, Thomas Kruijer at the University of Münster in Germany and Mathieu Touboul at the University of Lyon in France compared the ratio from two tungsten isotopes— both tungsten-184 and tungsten-182 – found in both moon rocks as well as within the Earth’s mantle. According to the teams, these moon rocks contain slightly more tungsten-182 than has been found on Earth. This is quite an exciting find, especially since this particular isotope of tungsten is actually the result of radioactive decay from an isotope derived of the element hafnium. Its half-life is rather short, approximately nine million years. Because the iron-loving tungsten has a tendency for sinking towards a planet’s core, the hafnium isotope remains closer to the surface, where over an extended period of time, it transforms into tungsten-182. That means there’s an excess of tungsten-182 within a planet’s mantle contrasted with tungsten-184 and other naturally occurring isotopes. That’s not so likely, however. Although most of Theia’s core, considerably heavier than the mantle, shall remain a part of planet Earth, the mantle itself will continue to mix with that of the Earth as it continues to be flung through orbit. As the moon gradually accretes, more chemical mixing will take place. Although the ratio of Theia’s core and its mantle material that actually transforms into parts of the moon is left up to random chance, there must have been at least a small degree of core material, according to Kruijer. Touboul’s team arrived at a similar conclusion: Were these differences in the tungsten actually the result of a random mixture when Theia’s shards sloshed across the Earth, our moon would be a great deal different than it presently is. Therefore, the simplest and most plausible solution, according to the authors of the study, is known as the “late veneer” hypothesis, positing that the Earth along with the proto-moon began with tungsten isotope ratios that were similar to each other. Since Earth was a much larger and more massive body, it would continuously draw in more planetesimals following the impact, giving the mantle new material to build a crust. The veneer from those planetary fragments would then have significantly more tungsten-184 compared to tungsten-182, and the moon would then contain the same ratio due to the impact. There is one remaining mystery to be solved. For the moon to remain identical to the Earth’s tungsten ratio, Theia and Earth would have had to begin with similar degrees of tungsten in their composition. Where did it all go? While there are a number of questions to arise from the study, ones that future studies hope to answer in the near future, it seems like a bit more light is waxing over the story of the moon’s origins.